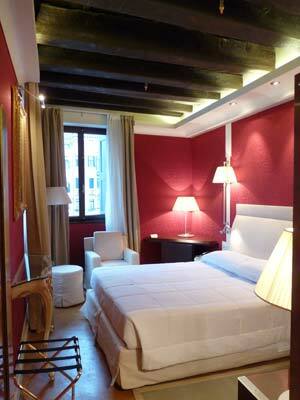 Hotel Palazzo Giovanelli e Gran Canal is one of the newest hotels on the Grand Canal in Venice. The hotel features modern comforts in a historic palazzo setting and is conveniently situated by the San Stae vaporetto (waterbus) stop. I made an online booking for a double room with Grand Canal views in March 2010, just a few weeks after the hotel opened. I paid €135 for one night. The hotel is easy to find: an elegant white building over a tiny canal from San Stae church and vaporetto stop, facing onto the Grand Canal. The entrance is over a bridge and around a corner (see directions below). The visitor enters through a grand stone gateway and across a tiny open courtyard. It's an impressive place to arrive; the grand reception area is full of original features with modern touches, clever lighting and green plants. Staff at the long reception desk were welcoming and after the passport formalities I was shown up one grand flight of stairs to my room, my suitcase carried for me. The hotel does have a lift; from my mezzanine floor this wasn't necessary. As a Grand Canal palace, the hotel also has a water entrance so guests can arrive more grandly by boat. The room I had booked was a 'Superior Double Room with View'. The bedroom was beautifully decorated and furnished, but quite small. However, it was in a good position on the first floor on the corner of the building. 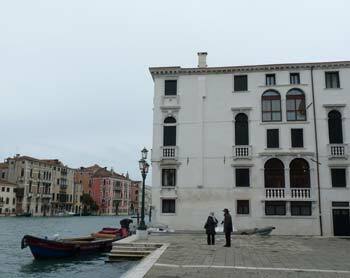 I had windows in two walls, with views over the Grand Canal and over the little square in front of the church of San Stae. Grand Canal views are a precious commodity, and it felt a real luxury to be here, standing by the windows admiring the view and watching boats go by. Sitting on my bed or armchair I could see along the canal to the casino, elegantly lit at night, and across the water to more palazzi, one still featuring traces of fresco on its facade. Vaporetti came and went at the ferry stop alongside, but the windows were fairly well soundproofed and though I could hear some noises, it wasn't enough to disturb me. The view was obviously the most dramatic feature of my bedroom, but the rest was good too. 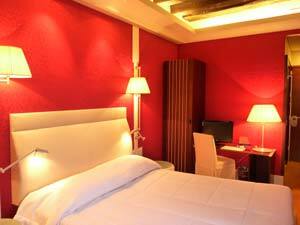 The room was furnished and decorated to give a modern sense of luxury while preserving a sense of Venetian atmosphere. The dark wood ceiling beams were exposed, with uplighting installed in a cornice beneath making them a feature. Walls were covered in rich red cloth, while pale fabrics and upholstery kept the atmosphere light and airy. There were lots of lighting options. As well as a comfortable bed, the room had a good armchair, better than the usual hotel standard, and a stool/footrest, providing extra seating options in the window corner. There were several surfaces (useful for people like me who always spread stuff around): a corner table concealing the mini-bar, bedside tables, a narrow console table and a glass-topped desk with a chair. The hotel provided a multi-lingual information folder. The white marble bathroom was a very good size, and contained a big bath with a shower above. A generous supply of toiletries was provided. There were two large mirrors in the bathroom, including a full-length one. Although a bit more space would have been nice, I was pleased with my room and found it very comfortable. The attention to detail, from the armchair to bedlinen quality, was good. I couldn't find many faults. I would have liked (I say this in most hotel reviews) a hook for coats and one for bathrobes. The wardrobe was small and half-height; there wasn't much clothes storage space. As normal there was no spare electrical socket under the desk for my computer. I didn't use the hotel's wifi service, but I understand that guests must pay for this, which is a shame. A polite maid came to my room for an evening turndown service to tidy, close the shutters and curtains, deliver bathrobes and slippers, and leave chocolates by the pillows. Four star hotels in Italy vary greatly in standard; Palazzo Giovanelli was definitely at the luxury end. I also looked around some other rooms before leaving the hotel. For a special or romantic holiday, I'd recommend - if your budget can take it - splashing out on a junior suite. These aren't really 'suites' but are larger rooms; the two I saw were on the top floor with superb Grand Canal views, large modern-style four-posters, a chaise longue, original painted decoration on the ceiling beams, spacious wardrobes and very large bathrooms. For an even grander option, the building's most important piano nobile rooms overlooking the Grand Canal have been converted into the 'Presidential Suite,' which has a bedroom resembling the junior suites, and a sitting area in the large central hall overlooking the Grand Canal, with glamorous frescoes and lots of armchairs where you could feel like a Venetian noble. The breakfast room is alongside the bar/reception area, with a buffet laid out on a central table and a waitress to bring hot drinks. It was a typical Italian breakfast buffet, with croissants, rolls, jam, honey and chocolate spread, yoghurts, fresh and tinned fruit, and slices of cold meat and ham. The waitress also offered to prepare scrambled eggs. The orange juice wasn't freshly-squeezed, but it wasn't watered down or sugared either, making it an improvement on most hotels. The long reception area continues into a bar and sitting area just inside the hotel's water entrance. 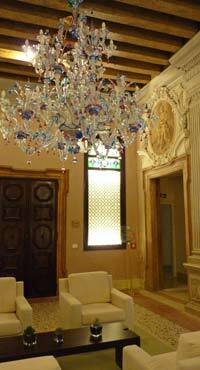 Upstairs is another lounge area; a grand space with frescoes and a huge Murano glass chandelier. 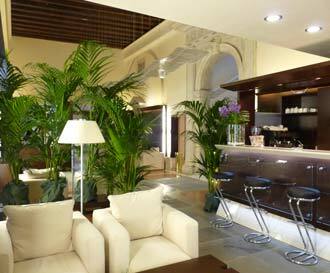 The breakfast area is on the ground floor and is quite low, but bright and fresh, decorated with plants. I think the biggest drawback with the hotel is that it doesn't have a public area with Grand Canal views, so if you don't specifically book a bedroom facing over the canal, you may still have a very comfortable (and cheaper) stay but you won't benefit from the hotel's biggest asset. I was very impressed with the way the building still felt like a classic Venetian palazzo. Although the hotel was up-to-date with modern features, they added to, rather than diminishing the atmosphere. The combination of grandeur, efficiency and comfort worked extremely well. The staff I encountered were all charming and spoke good English. I think it shows good training and a good ethos when hotel chambermaids and waitresses, like the ones here, seem happy and friendly. The receptionist was welcoming and helpful. The hotel is very convenient to reach by public transport. From the bus station at Piazzale Roma or the railway station take vaporetto number 1 to San Stae, just a few stops away. The hotel is the building facing the canal on your left as you alight. To reach it you have to cross one small bridge and follow the hotel's sign around a corner to their entrance on an alley. Through a gateway you cross a small courtyard garden and enter the stylish reception / lobby area. The hotel is obviously very handy for Venice's vaporetto service, but you can also walk around easily. The Rialto Bridge and Rialto market are about a ten-minute walk away and there's a good restaurant (La Zucca) nearby, on the way to a pretty square called Campo San Giacomo dell'Orio. 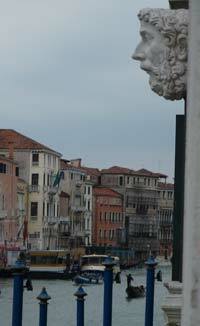 The area between the hotel and the Rialto is a tight-packed maze of tall, enigmatic buildings, alleys and bridges. I always find it mysterious, and evocative of nineteenth-century pictures of the city. Newcomers to Venice shouldn't be alarmed by the narrow lanes; Venice is a very safe town, night and day. The town's modern art gallery, Ca' Pesaro, is almost next-door to Palazzo Giovanelli and is worth a brief visit. My hotel bedroom was impressively comfortable with great views. The hotel had a tranquil atmosphere (though that was partly because of the scarcity of guests). I think it's a shame that there were no public spaces with views of the canal, but I couldn't fault any other aspect. Service was good, the proximity to a vaporetto stop is very convenient, and this is an atmospheric area of Venice. 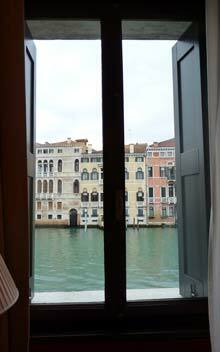 It's not the only good hotel along the Grand Canal, but Palazzo Giovanelli had competitive prices - you'll always pay a hefty premium for Grand canal views - and an effective balance of history and modernity. I'd definitely return again, or recommend it to holidaymakers looking for a memorable spot. It would make a good romantic destination. Review and photographs by Italy Heaven editor. I travel anonymously and pay the full price for my accommodation.